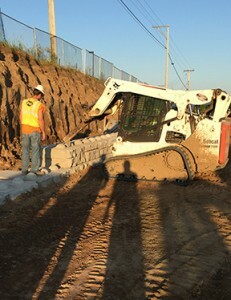 Hardscape Construction specializes in the design and construction of large-scale commercial retaining walls. We combine over two decades of field experience with value engineering solutions to provide the most economical and aesthetically pleasing earth retention systems available. When you face challenging soils or unrealistic site constraints, Hardscape has the equipment, technology and skilled construction professionals necessary to tackle the most complex earth retention scenarios. Segmental retaining walls provide a wide variety of aesthetically pleasing color and style options installed in a virtually unlimited number of customizable configurations. Hardscape installs attractive, mortarless concrete fence systems that provide maintenance-free security and privacy. Constructed with high–strength concrete block units, steel reinforcement elements and concrete core-fill, these systems are unmatched by traditional wood, vinyl or metal systems. These systems are available in an endless variety of colors and patterns to complement any landscape.